Bacon Blue Cheeseburger Potato Skins. Perfect for Super Bowl weekend? I think so. You can find the recipe on the Tasty Kitchen bah-log. 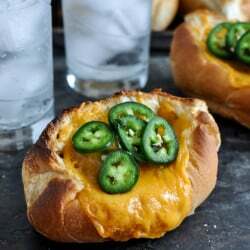 Jalapeño Cheddar Chicken Meatball Sandwiches. Wow, these look dangerously good! My husband would love them! I mean…. too good for words. Wow: what a fantastic idea! Such a great spin on a potato skin (and yes, so perfect for Super Bowl parties, and i’m in the middle of recipe-hunting for it as we speak.) Love these. You are my go-to source for superbowl food. Just so you know. My eyeballs are having the time of their lives right now. Yep… I’m drooling over here. I LOVE blue cheese. On anything. Only you can make me crave bacon blue cheeseburgers at 9am. Thanks for that. I literally got butterflies in my stomach and had my mouth water at the same time. Also, I got kind of angry… because I’m at work and not stuffing my face with these. You always challenege my pescetarianism. Ohmygawd. My husband would die and go to heaven with these! What a great weekend comfort food! Ohhhhh, that sounds so good! I am so checking it out!!! Well, now the Superbowl just won’t be complete without these. Those look like a perfect game day app! Wow ~ these look amazing!! I don’t even care for the Super Bowl game.. but this sounds good for that day or today! Why do your messes look SO much more fun than mine? Ohhhh, that’s right. Because I close out my window and they’re gone. Unlike my constantly overflowing sink. …sinks should have close-out buttons. why can’t I think of these genius ideas? i’m humbled by your crazy recipes. This is like the invention (cocktail umbrella, etc) that everyone else wishes they had come up with first. These skins are the cocktail umbrella for me. Damn you. Ummm is this real life? This looks incredible! Perfect for the game on Sunday!! You had me at blue cheese! Thanks for the recipe. Yum! Making these for the Superbowl this weekend! ooooohhhhhhh! I think I’m making these NOW! I am so making these Sunday for the Super Bowl! I LOVE, LOVE, LOVE your blog! 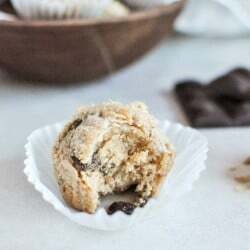 It seems like every time I search for a recipe it’s embedded in a blog, and usually I just tolerate the blog stuff to get to a recipe, and I don’t necessarily like other recipes on the site…but i love yours, I’ve been looking at recipes and reading your blog for over an hour and I want to try them all! I have supper for my family planned for the next month! Thanks! There are no words! Except maybe that I need these right now!